What happens when a group of young people with autism set out to do the impossible; that is, to stage and star in a full-length musical? “Autism: The Musical” is director Tricia Regan's answer to that question. Released in 2007, the documentary film follows individuals with autism who star in the show. The film also shares the stories of their parents, as they support their children in this challenging endeavor. “Autism: The Musical" centers around the Los Angeles-based The Miracle Project, founded by Elaine Hall, an educator, writer, and coach. The Miracle Project seeks to empower individuals with autism to express themselves through the performing arts, and “Autism: The Musical” is an inside look into The Miracle Project's first production. “Autism: The Musical” has received two Primetime Emmys (for Outstanding Nonfiction Special and Outstanding Picture Editing for Nonfiction Programming) and numerous other accolades as well. It is now available for purchase and rental on DVD. Recently, Autism After 16 spoke with the film's director, Tricia Regan. 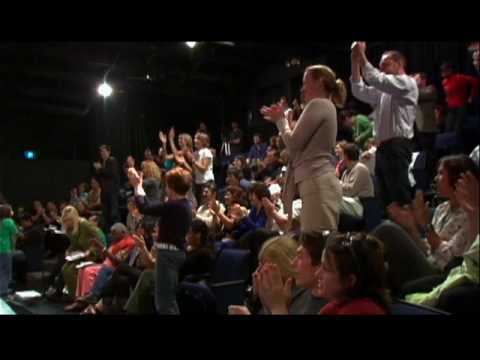 AA16: What prompted you to make “Autism: The Musical”? TR: Actually, I was asked to make the film; I was approached by a group of people who wanted to make a documentary about autism. I was basically giving them free advice for about a year, thinking they might not actually make the film, or raise enough money. My advice was not to make a film about autism, but to make a film about a group of kids who trying to achieve something, a group of kids whose autism happens to be the obstacle standing in their way. People who are struggling against all odds, to achieve something they shouldn't be able to achieve … it's your basic structure for a three-act play or movie. One of the executive producers knew Elaine [Hall], who had just started working with kids with autism [at The Miracle Project] … so I said, shoot some stuff, put together a trailer, raise some money, and we'll go from there. And they were able to find a funder, and fly me to L.A. to direct. The process itself was “against all odds.” After three months the funder didn't come through with the money we expected him to … we had a month worth of footage shot by then, and no money. It was hand-to-mouth for every week of production after that. After finishing up the film, we found a company that funded the post-production; they own the film now. It took a lot of faith, a lot of praying to make it happen. AA16: What was your first impression of Elaine and The Miracle Project? TR: The first that I saw her was in the trailer that [they] shot, so that half-prepared me for meeting her. I've never seen anybody more patient with kids in my life. Her patience with kids with special needs is super-human. She jokes how she has way less patience for kids who are typically developing! It's kind of amazing to behold the patience that she has … and she's very tiny, yet she has a big presence. That made filming easier. It's easier for me to hold the camera at waist level, and because she's closer in size to the kids, it's also easier to frame the shots—it made the shooting way more intimate. TR: There were two scenes that really kicked me in the stomach. The first one was early on, though it happens later on in the film, partly because it's so intense. It's when Hillary, Lexi's mother, is talking with a group of mothers. She says something like, “Who says, I hope my child dies before I do?” It kicked me in the stomach because I got it—here's this woman who loves her child so much, and she's so distraught that her child is living in a world that doesn't accept her, and there's nothing she can do about it. The next moment was when Neal was at the speech therapist, when he started speaking through the typing machine. I'd known him for a year at the time, and he was very attached to me. When he started speaking, I thought, “Wow, that's what your voice sounds like.” Elaine was crying, I was crying, because Neal was finally able to speak! He's this smart kid, saying these really intelligent things—but he hadn't been able to have a voice until that moment. It broke my heart and elated me at the same time. And I love the smile that he has at the end of that scene, because to me, it's the same smile that he has when he's rolling around with Elaine on the rug in the orphanage, as a baby. It was very important that every main character have a journey, and for every main character, there's a turning of the screw, a significant change—and that's Neal's moment. AA16: What do you think is the greatest challenge that parents face as their children with autism become adults? TR: The first really big challenge is having to let go of the dream of who this child would be, and accept that this child is on a very different path than you had hoped. And I think for most parents, it's their worst nightmare. And once parents move through that, then they can start to see the kid for who they are, and begin to enjoy them for who they are. That journey is portrayed by Hillary in the movie, starting from a place of non-acceptance, and moving toward acceptance, as played out in the film. On some level, there's always a sense of mourning for who this child could have been, but I think any parent of a child with autism will say that there are special gifts that this child brings them that they never could have dreamt of. The other big challenge for parents is simply moving through the world with their children with special needs. I think it's gotten better—and the film has helped to make it better. It's not the only reason; there's a lot more awareness of autism. However, the people I know who have seen the film have been much more understanding of adults with autism. Every parent's story starts out “normal” and then they get the diagnosis. People who watch the film can feel themselves in the stories of each of these people. It humanizes autism. AA16: Do you think the experience of having their children featured in the film was difficult for their parents? In what way? As I was shooting that scene, Neal looked to make sure his stepfather was watching, and that the camera was filming. And so I said to Elaine, “I think maybe Neal wanted this to be filmed.” She privately asked [Neal], and he said it was OK, and that's why she allowed it to be in the film. I think people understood he was stressed at the party. Also, I think that if we'd made the film without that scene, it might have been brushed off as a “nice, nice film.” We needed to show the darkness [of life as a parent of an individual with autism] for people to take it seriously. For each parent, watching the film is like looking into a mirror—it's difficult. And it's the scariest moment for me, showing the people who are in my film, my film. They usually react badly, and they have to sit with it and see it again. I don't think anyone [who participated] regrets it now; it's only brought good things to the kids involved, and to the [autism] community as well. AA16: “Autism: The Musical” has received numerous accolades and positive reviews, particularly one in The New York Times. What's been your experience of the success of the film? Has it changed your life in a significant way? TR: I knew I had something really special [with this film], especially as we were coming close to finishing it up. So it didn't surprise me how well it did; what surprised me was how little effect it had on my career! [Laughs] Documentary is really tough; I won an Emmy right before the market crashed, and I did get a lot of [directing] offers that following year, but a lot of those offers fell through. However, I'm producing an MTV series right now, and also working with A&E and ABC. I would love to do another film in the future, but I don't know that I have it in me to go broke for the year, so itt would have to be a film that was funded from the start. [“Autism: The Musical”] was a rare documentary film in that it actually made money in the end. It took a lot out of me, though, on so many levels. I was shooting every week for six months—until you start editing, you don't know you have a film! I felt a lot of pressure that whole time. AA16: How would you describe a healthy relationship between a parent and a child who is coming into adulthood on the spectrum? In your experience, what qualities are vital for parents to cultivate in themselves in such times of transition? TR: I'm certainly no expert; I'm not even a parent of a child with autism. What I do have, however, is experience in seeing how half a dozen families were with their young adults. I think the biggest thing is just love. It's so simple. If you love that kid, and they're in the center of your heart, you will figure it out. Every kid on the spectrum is going to have different needs as they transition into adulthood, and it's a much bigger question mark for adults with autism in their differing abilities and challenges. For example, even figuring out if they're having sexual feelings, that's a challenge. And it's crazy because, since the film was made, these young adults have grown up! Lexi is 19 now! And, you know, you can ask for advice and talk to a lot of people, but I found that the expert on each one of these kids was their mother! And [the parents] may have made mistakes, but they were 150% behind their kid, every time. AA16: What do you think is the film's core message? TR: The goal of the original producers was to make a movie that could show the world how great individuals with autism are. That was the goal that I took on in making this movie, but I think the core message is just love. Love can move mountains. It can. It has. It does every day. Love opens up the world for [individuals with autism], and allows them to blossom, to the full extent that they are able to. And that is a message for every one of us, everywhere—and that's why the film is successful.